Intention: the Millennium Falcon before extensive mods. 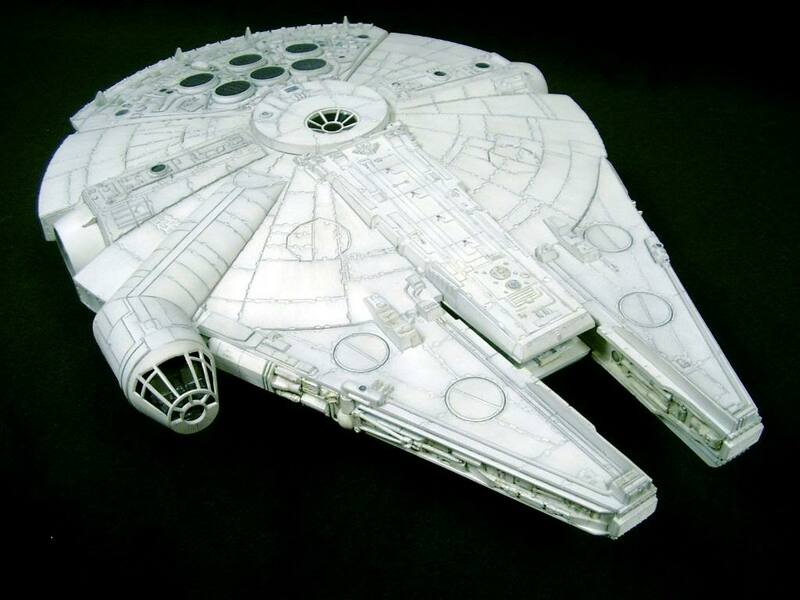 Reference: the Millennium Falcon after extensive mods. 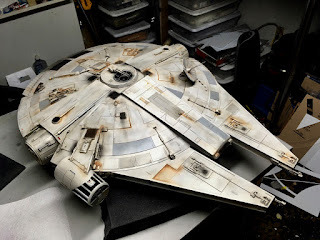 I mention briefly in this post about me being greatly inspired to return to modeling (after a two decade hiatus) specifically by seeing all the amazing models of the Millennium Falcon people have been building and posting online on various fora and YouTube, but I'll go into painstaking detail about my decision/attitude here (mostly for my own records and to document my motivations/rationalizations for this project). My first view of the ship was in the cards in 1977. 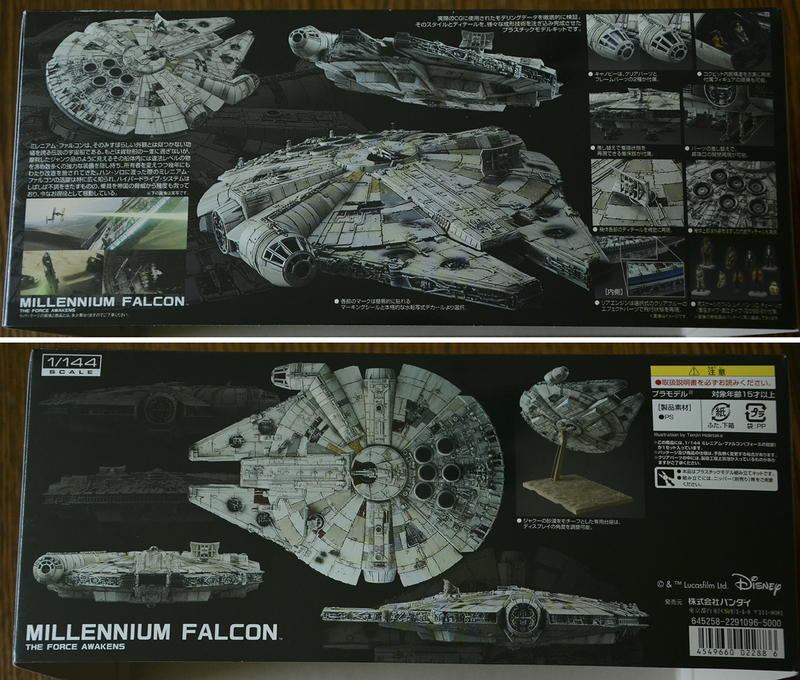 My attitude at the time (winter 2015/16) was that I didn't want to build a screen accurate Falcon because so many great ones have been built (and people will continue since Bandai keeps making great kits). I usually prefer to make my own, customized projects...and I thought there was only one other option: customizing an MF kit to be a different ship of the same model in the Star Wars universe (there are pictures and a link further down below showing examples of ships others have built/illustrated). That angle still didn't satisfy my creative needs as I'd still be playing in someone else's universe and my invented ship wouldn't be "real" (I know: none of this stuff is "real," but I need my own internal logic for building these things). Another early view thanks to Topps. 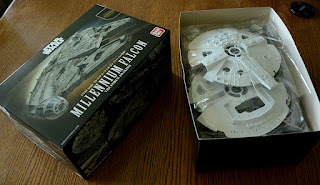 I still got inspiration from looking at finished models and watching people build them, learning more about the hobby in the process, but abandoned the idea of building a Millennium Falcon model myself...until I had an idea while looking at some articles about Industrial Light and Magic's development and creation of the original Falcon for the original Star Wars released in 1977. 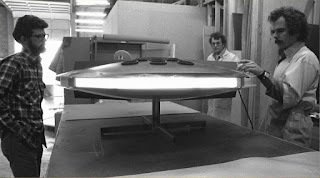 At ILM, before the greeblies. 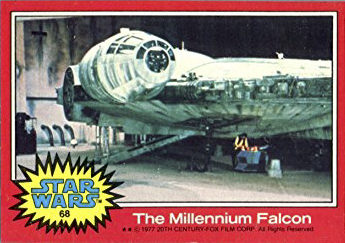 I wasn't interested in building an early Joe Johnston/Ralph McQuarrie concept version (or any other early conceptual versions that only exist as drawings) of the Falcon because, while an interesting archaeological and interpretive (transpositional?) exercise, the idea doesn't hold that much creative/inventive interest for me. Besides, Jason Eaton has scratch-built an amazingly, phenomenally impressive, skillful, polished, and beautiful interpretation of that. Truly well done, sir. 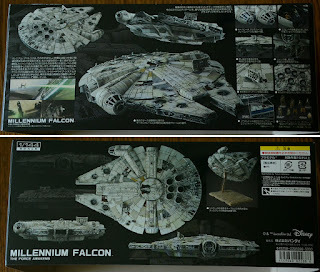 So, apart from Han Solo's ship as seen in the movies, a different ship of the same type but customized by me, or early concept versions of the final model, what else is there if I wanted to build a Millennium Falcon, taking advantage of the recent kit by Bandai which is as amazingly detailed and easy/fun to build as their other Star Wars kits? ...and its amazing box art. Speculation about the Falcon's in-universe function has been around since 1977; it's described as a "freighter," but it seems a little small to be very effective as one, and it's been heavily modified by Solo, so it's not in its original configuration...so...what would a factory stock YT-1300 light freighter look like? There's been lots of speculation about that, too, with illustrations and models being built for decades with some crossover details/ideas but no true consensus. And how could there be? 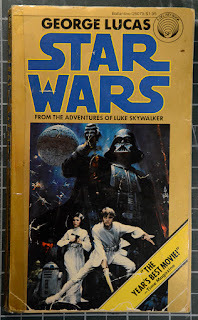 I guess there are now "official" books put out by Disney/Lucasfilm, but unless we're shown one onscreen, where someone would have to make final decisions about it that often override previously printed material, we're left guessing. Or guessing, inventing, and extrapolating –which is what I've done below, using a selection of sources. 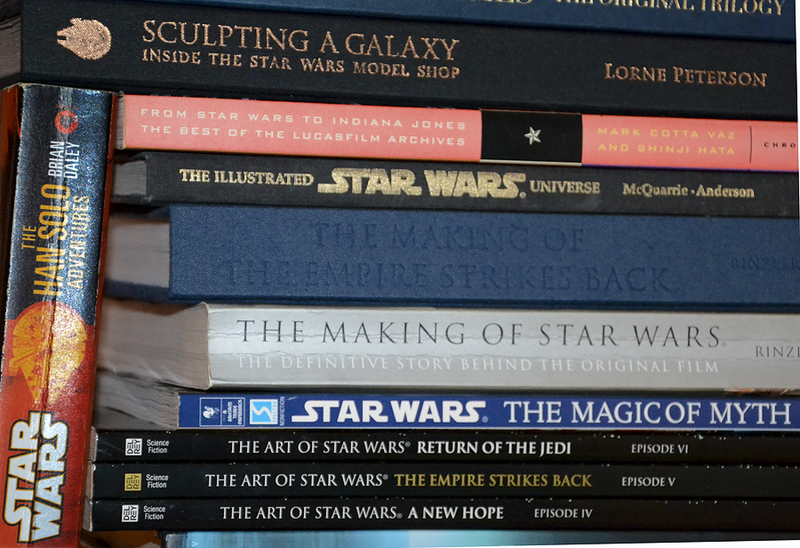 My main sourcebooks for this project. I've limited my research references to materials (mostly) no more recent than Return of the Jedi (1983). 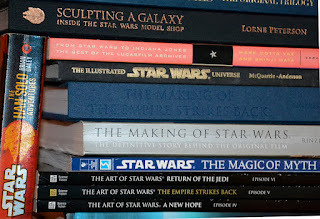 Some materials are very recent, like interviews with ILM model makers, but they refer to the original models, so the discussion is still pertaining to my preferred vintage. My reason for this is I'm imagining myself building this model as a young person in the mid-to-late 1980s, using whatever info I would have had at hand (but with my current modelling skills). 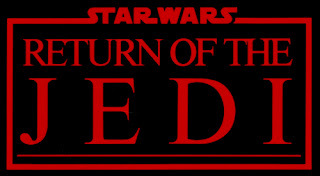 There's just so much Expanded Universe and other recent "official" paraphernalia out there that I felt overwhelmed by the research, so limiting myself to an early era of my personal Star Wars fandom (which was still pure and uncomplicated, untainted by uninspiring prequels, uninspired sequels, and boring novels) was the best approach. I'm building this for myself to satisfy my own curiosity and imagination, and to exercise, test, and improve my modeling skills. And don't get me wrong: I really do like the look of the Falcon with all the greeblies and weathering and prefer that look to a clean, fresh one, but I'm fascinated by the notion of the latter. 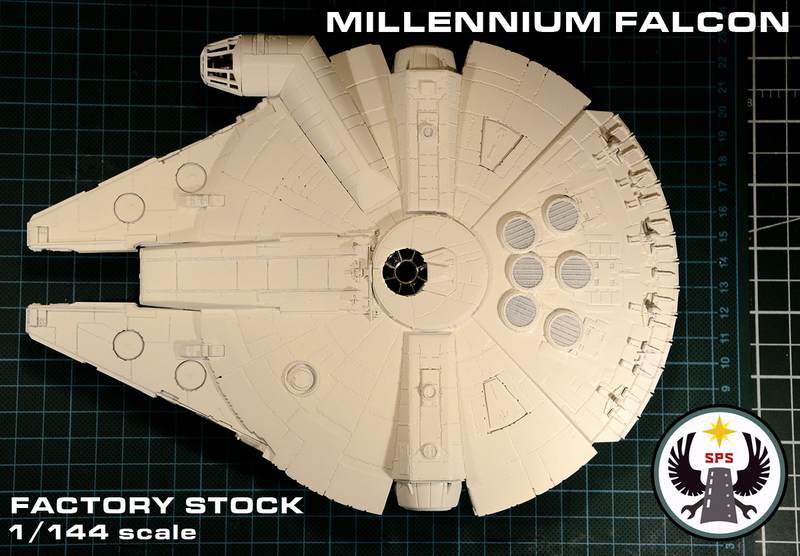 So, while I usually don't like seeing where the things I love come from, I'll be turning back the clock, so to speak, undoing all of Han Solo's and (as I'm interpreting it) Lando Calrissian's modifications, and building the Millennium Falcon as a brand new, Factory Stock YT-1300 Light Freighter in a showroom diorama –as though you could go there and buy one from the dealer. So I am building the Millennium Falcon itself after all...just before anyone bought it and started making any "special modifications." 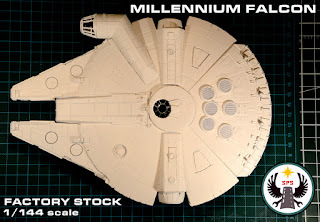 Of course, I'm not the first person to ever think of this, nor am I the first person to illustrate or make a model of a factory stock YT-1300 light freighter (and/or variants thereof). Nor will I be the last –and we'll see if the upcoming Han Solo movie in 2018 has anything new to add, if anything (I'd like to finish my projects well before that movie comes out so as not to be influenced by it in any way). 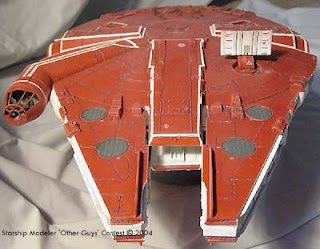 Merrill's idea for his model is much like my own: what does an unmodified YT-1300 freighter look like? He's right about there not being any pictorial reference for that, and he's taken the same general approach as I did in "undoing" the modifications apparent in the ship we see on film. He's created his own imaginative reasons for the changes he's made and I see them as no less valid than my own, since we're both making up a lot of this. Merrill appears to have used the covers for the six rear exhaust ports as covers for the mandible maintenance wells (I thought about doing that myself, since they fit quite nicely). He's dropped the engine deck, which looks good, but I wasn't prepared to commit to that much surgery, not having that kind of confidence in my building skills yet. It's interesting to note he scratch-built a rectangular sensor dish more than a decade before a similar one appears in The Force Awakens to replace the one Lando accidentally knocked off in Jedi. This makes sense to me as the round dish the ship has in the movies is likely an illegal mod (backed up by reference material below). For that reason, I considered using the rectangular dish that came with the kit, but decided against it, but still leaving the mount in place as though a dish was optional (the conceit being that this model of freighter is highly modifiable, but not everything comes standard). This model appears to have been based on an image of a stock freighter in the Haynes Manual which has the same design for the covers for the mandible maintenance wells, no breaks in the surface paneling to allow for a sensor dish (and nothing on the opposite front side), a big reduction in greeblies along the sidewalls, and paneled covers for the rear maintenance ports. The Haynes illustration does, however, include weapons in the middle of the ship, and a number of micro panels on the surface. Aside from the clean look of this and those great mandible well covers –both logical extrapolations of what a stock freighter might look like– I'm ignoring the written backstory the folks at Haynes have made up (official or not) in favour of my "limited (mostly) to information available by the late-'80s" approach. Both models have retained the distinctive hull plating (with those notches along most sides) and I'll be doing the same. These panels appear to be shielding, some kind of heavy armour, possibly added as an after-market modification (taking a close look at photos of the full-scale set, as well as close-up photos of the 5-foot model reinforces this perception). I thought about filling in the gaps between panels (easier than sanding them down), but if it is armour on top of the regular hull plating, it still might be of use for a freight hauler, especially the way I'm planning on setting up my smaller-scale cargo diorama (that is, if you're not a perfect pilot, you might occasionally brush up against machinery or scrape the hull against the cargo carriage). See more YT-1300 variants HERE. Smaller stock version in progress. Above is my little Bandai Falcon (approximately 1/350 scale) that I've built to be part of a diorama of the ship attached to a cargo carriage of my own (kitbashed and scratch-built) design. You can see the cockpit is rotated 90° in order to fly like a sunfish (as originally planned by George Lucas; see below). Building this little version first was a sort of prototype to see how much I'd want/need to change when I build the larger (1/144 scale) version. BEN: "...If it's a fast ship." HAN: "Fast ship? You've never heard of the Millennium Falcon?" HAN: "It's the ship that made the Kessel Run in less than 12 parsecs." HAN: "I've outrun Imperial starships. Not the local bulk cruisers, mind you, I'm talkin' about the big Corellian ships, now." HAN: "She's fast enough for you, old man." 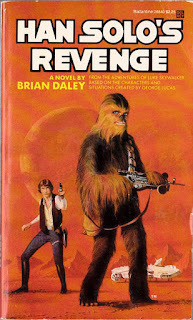 Soon afterward, Han shoots a thug in self defense. Later, in Docking Bay 94, when Luke exclaims "What a piece of junk!" Han's reply is "She'll make point-five past light speed. She may not look like much, but she's got it where it counts, kid. I've made a lot of special modifications, myself." It appears a YT-1300 freighter usually has a crew of at least four (pilot, co-pilot, navigator, and communications) as the four seats in the cockpit would imply. This notion is backed up in Brian Daley's second Solo book (see below), and two extra crew members are present in those positions in Jedi when Lando flies the Falcon in the battle above Endor (also below). Han reaches back to the nav position. After the Falcon is brought aboard the Death Star, Tarkin is informed that they've "captured a freighter entering the remains of the Alderaan system. It's markings match those of a ship that blasted it's way out of Mos Eisley." C-3PO: "Sir, I don't know where your ship learned to communicate, but it has the most peculiar dialect." Aren't you a bit snobby for a protocol droid? LANDO: "What have you done to my ship?" HAN: "YOUR ship? Hey, remember, you lost her to me, fair and square." Lando gives him a skeptical look, then a sly one. But lost in a bet or a game? LANDO: "You know, that ship saved my life quite a few times. She's the fastest hunk o'junk in the galaxy!" As mentioned above and below, Han and Chewie manage to fly her by themselves, but the Falcon should normally have a crew of four in the cockpit: pilot, co-pilot, communications, and navigator. Communications guy behind Nien Nunb. It's probably safe to assume there are normally (and especially during this battle) at least two other crew members –one each– in the top and bottom gun ports. Aside from Solo's remark about "special modifications" (about which, we can infer refers to the extensive piping, greeblies, and opened sections of the ship (inside and out)), there's little else in the movies to let us know just how much was original to the ship and how much was added later. That it looks like "a piece of junk" to Luke, that Leia asks, skeptically, "you came in that thing?" 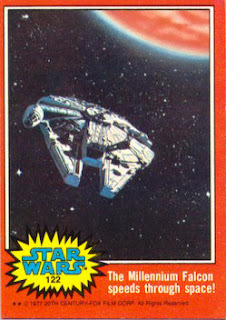 and that Lando refers to it as "the fastest hunk o' junk in the galaxy" could refer to its age or appearance or both. From the movies alone we don't know how old the ship is, who (if anyone) had it before Lando, and what exactly were (and who did) the modifications...and it doesn't matter to me, since I'm not telling the story of the Millennium Falcon, I'm just trying to imagine what it looked like right before its first owner bought it. "At one time, the Falcon's cockpit was to be motorized so that it could rotate ninety degrees. Lucas had the idea the ship would fly like a sunfish, landing flat, but at take off the body would rotate and the cockpit would remain in the same configuration. Though the end model did not include this feature, the cockpit module remained sleeved and could be rotated." Along with describing a bit of the origin of the design of the ship, he refers to the mandibles as the "loading arms" and says "Even though the ship is supposed to be a 'spice freighter' I didn't want the shape to give any indication of its purpose. It's a big hot rod, pure and simple." "We justified the mandibles by saying they could be a freight-loading area where your cargo goes in. Something comes out and grabs the freight and takes it back into the ship." Johnston also had a video on his YouTube channel in which he discussed plans for the Falcon flying vertically like a sunfish (as mentioned by Lorne Peterson above), but many of the videos have been removed for some reason. Ghost-written by Alan Dean Foster. 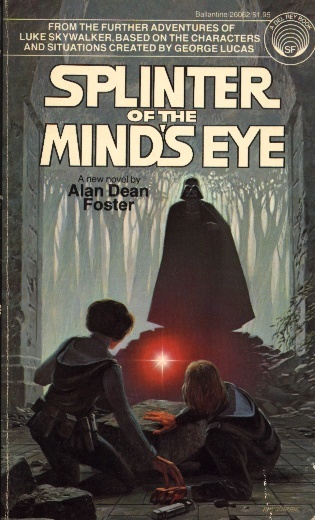 This book first came out in December 1976, about five months before the actual movie did. As much as it seems like reading this before seeing the movie would spoil that experience, it still would have been mind-blowing to see the revolutionary visuals and action on the big screen. 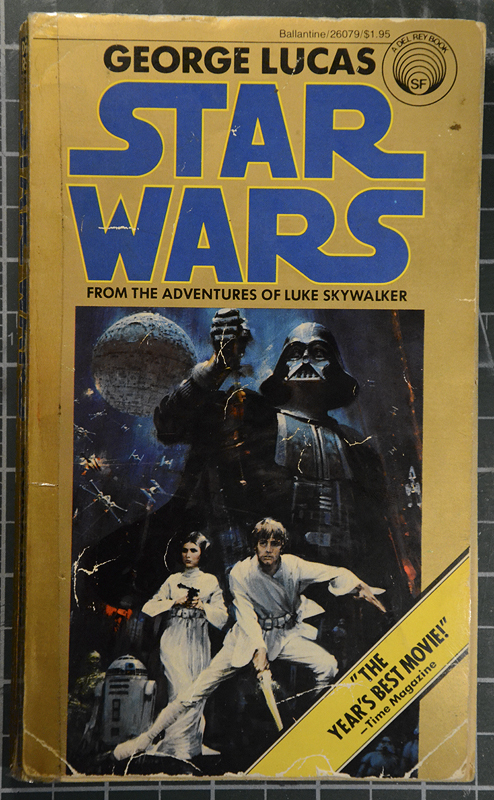 I don't know if that first edition had the colour photos in the middle, but my Sixth Edition from June 1977 (pictured above) has a nice selection of pics from the movie. There's not much about the Falcon here except, interestingly, Han says "It's the ship that made the Kessel run in less than twelve standard timeparts!" –rather than the "twelve parsecs" from the film. The description of the ship itself is great and follows soon after an interesting paragraph about spaceships needing a sublight drive to get away from a planet's gravity well and then kicking into supralight travel once clear. "That battered ellipsoid which could only loosely be labeled a ship appeared to have been pieced together out of old hull fragments and components discarded as unusable by other craft. The wonder of it, Luke mused, was that the thing actually held its shape. Trying to picture this vehicle as spaceworthy would have caused him to collapse in hysteria –were the situation not so serious. But to think of traveling to Alderaan in this pathetic..."
I have a real soft spot and admiration for the Brian Daley Han Solo books. 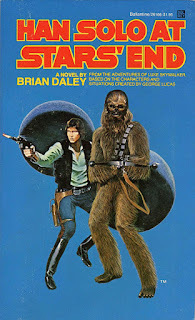 They came out right after Star Wars when all we knew about Solo was what we saw onscreen (the Star Wars Holiday Special and the Marvel comic books were fun-but-weird in their own special ways and don't have any bearing on my YT-1300 projects). 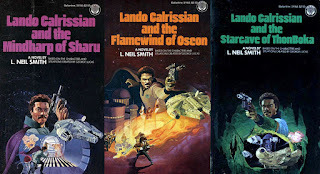 Additionally, there were three Lando Calrissian books by L. Neil Smith that all came out in 1983, but which I haven't read yet. 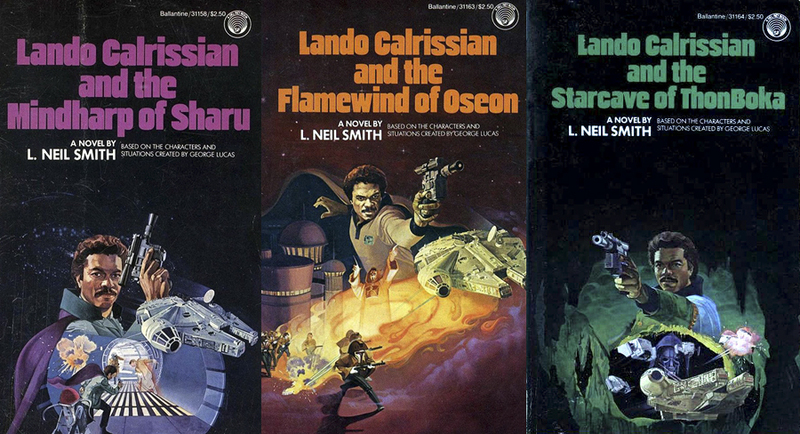 The covers are pretty good (the likenesses of Billy Dee Williams are great, especially on the first book) but the Falcon looks really weird on all of them (something I noticed when I saw these on bookstore shelves back in '83...and I think that may have put me off from buying them (harsh? maybe, but keep in mind, I would have been all of eleven years old)). Regarding the Falcon: LOL, wut? But it isn't just that Daley's books were (aside from the comics) the first "expanded universe" Star Wars materials produced, they actually capture Solo and Chewie's characters quite well and the books did something it seems none other since has been able to: avoid making constant references to things, or bringing back characters and/or locations, seen onscreen in the Star Wars movies. 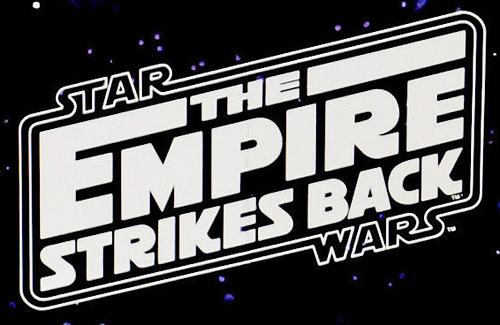 There are a few references to the Empire and at least one Clone Wars mention, but these are otherwise wonderfully standalone stories set an undefined period of time before the events in Star Wars. 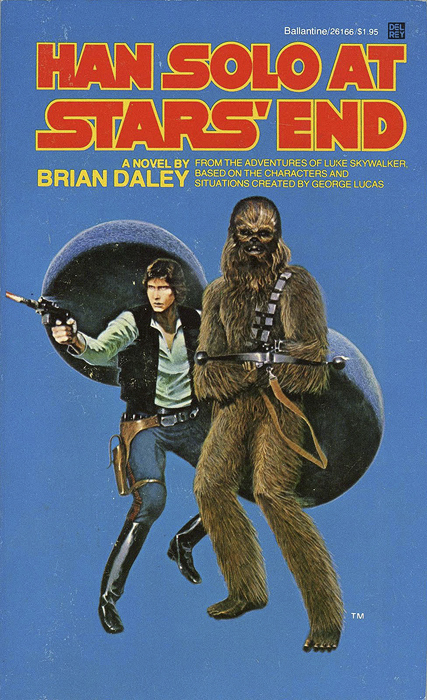 The books have no tedious or cheeky or eye-rolling explanations of the few things we know about Han Solo, Chewbacca, and the Millennium Falcon; no unnecessary and obsessive connecting-the-dots; just adventures. 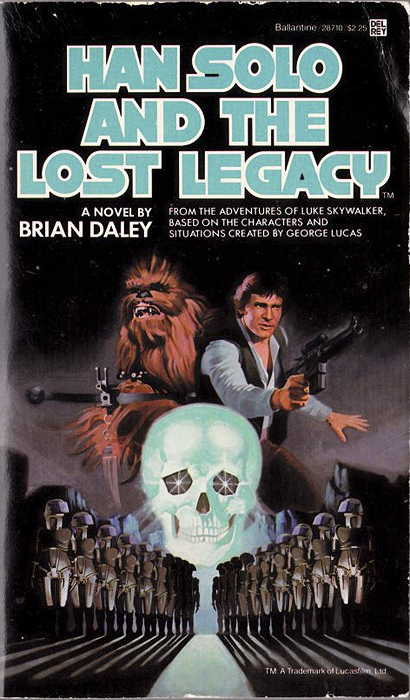 I'm sure Daley had restrictions imposed on him about how much of the Star Wars universe he could mention and how much he could develop Han and Chewie's characters (beyond portraying them –regarding the ship– as extremely competent mechanics), but the books are stronger for leaving out most of the known Star Wars universe and keeping the characters' histories somewhat mysterious. This avoidance of known materials in favour of creating new elements serves to make the galaxy a bigger place, whereas constantly making references, revisiting locations and characters serves to make the galaxy smaller. These really do seem like adventures Han and Chewie would have had prior to meeting Luke and Ben on Tattooine. 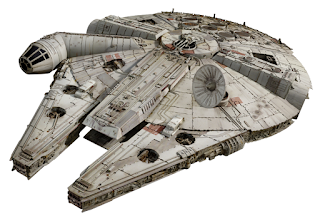 Much of what Daley reveals about the Falcon simply underscores what Solo said in Star Wars about his "special modifications..."
Upon learning the Falcon (using the name Sunfighter Franchise) has been impounded by the Corporate Sector Authority, Solo claims that the ship's got all her (forged) approvals, to which the officer responds, "Those're outdated. Your ship fails to meet new standards. The Authority redefined ships' performance profiles," then he lists a number of violations: "lift/mass ratio and armaments rating way out of line for nonmilitary craft...a lot of radiation shielding got removed when the thruster ducting was chopped and rechanneled...[the ship has] irregular docking tackle, augmented defensive shields, heavy-duty acceleration compensators, and a mess of long-range detection gear." He then states that the ship will have to be refitted to original specs in order to be legal. Sonniod studied the starship that had once been, and still looked very much like, a stock light freighter. That she was heavily armed and amazingly speedy was something Han preferred not to have show externally. Such display of force would have been too likely to arouse the curiosity of those entrusted with enforcement of the law. "She looks spaceworthy enough to me, Sonniod commented. "Same old Falcon–looks like a garbage sledge, performs like an interceptor." To replace the Falcon's recently blown shielded circuitry, he "had to load up on adaptor fittings and interface routers and use gas and liquid fluidic components," those being the only thing available at that time and place. "I hate them," said Solo. "I can't stand the thought of all those flow-tracks and microvalves in the Falcon and I can't wait to rip 'em out and retool her." 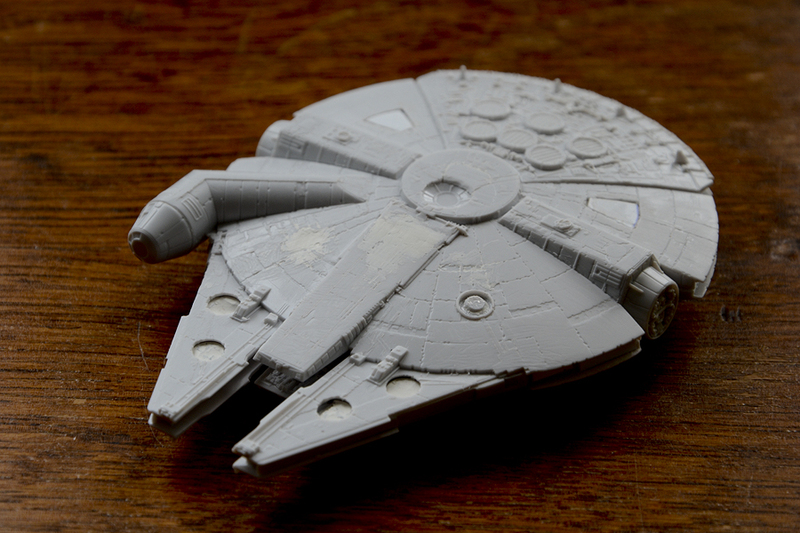 The Falcon was no ordinary ship, and she had been modified to resist boarding or break-in efforts. Among other things, the relatively unsophisticated lock and other security gear had been replaced with the best Han could build, buy, or steal. Tool and equipment that could crack a stock freighter in minutes wouldn't even make the Falcon nervous. ...Han and Chewbacca habitually spaced by themselves, Han reaching back to his left to carry out navigator's chores and the Wookiee leaning to his right to run the commo board when needed. Talking with Chewie, Spray, a skip-tracer for Interstellar Collections Limited makes virtually the same observations about the Falcon that the CSA officer did in the previous book: "The exterior is a deception. Why, some of the equipment you've installed is restricted to military use...And her armament rating's way too high, as is her lift/mass ratio." Spray continues: "And just look at this; some of these systems are fluidic!...What is this, a starship or a distillery?" And later: "Nothing in this slapdash ship makes any sense to me. She looks like a used loadlifter, but she's got higher boost than an Imperial cruiser. I don't even care to think about how jury-rigged some of those reroutings must be." The Millennium Falcon...looked very much like the battered, much-repaired, and worn-out stock freighter she was, but there were incongruities. The irregular docking tackle, over-sized thruster ports, heavy-weapons turrets, and late-model sensor-suite dish betrayed something about her real line of work. "Over many years, dozens of minor laser hits and micrometeoroid punctures have been patched with micro-panels (or even left alone), giving the ship a dilapidated appearance." The small panels being patches is a nice, logical conclusion since they're located seemingly at random. They were the first things to go when I started scraping off details.